Jamaica Estates is an affluent neighborhood in east-central Queens at the end of the F subway line. It's known for its Tudor-style houses and as the childhood home of Donald Trump. 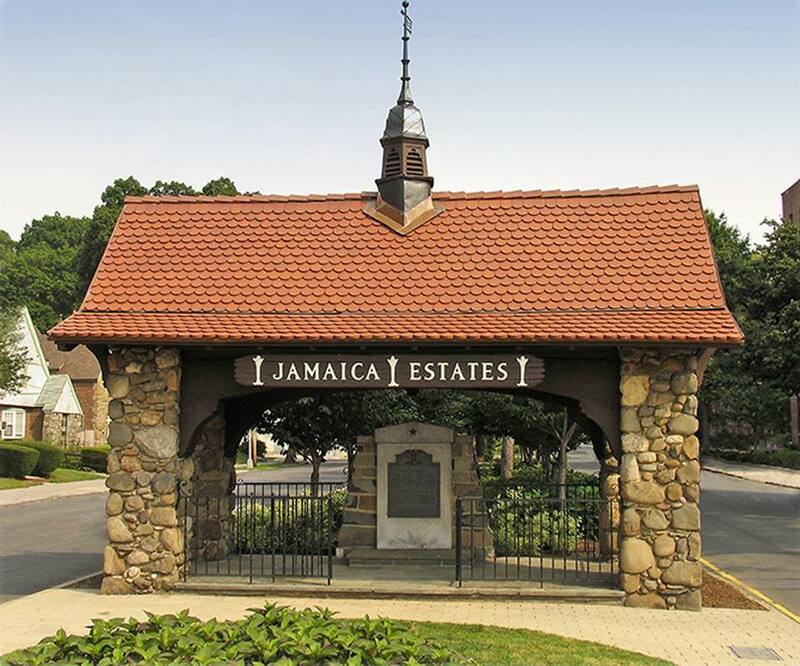 Jamaica Estates was a planned community, developed literally from the ground up as a suburb in the early 1900s, and the neighborhood still has that suburban feel. But the neighborhood has slightly changed its look: Houses with much larger footprints have replaced some of the older houses on some of the largest lots in the neighborhood. Unlike most of the Queens grid, the neighborhood has a decidedly pastoral feel, with hilly, winding streets lined with trees, that is often called a "leafy suburb." The developers made a conscious attempt to preserve the park-like land, and now the neighborhood has many 200-year-old oaks, maples, elms, and chestnuts, contributing to the ambiance. Real estate is mostly single-family houses, and some are quite large -- in the mansion category. Properties on larger lots tend to sell for well north of a million. Some co-op apartments and rentals can be found closer to Hillside Avenue. Jamaica Estates meets Fresh Meadows to the north along Union Turnpike. To the east is hilly Holliswood at 188th Street. The southern boundary is the commercial strip along Hillside Avenue (and the farthest reaches of the F subway). To the west is Jamaica Hills at Homelawn Street and the campus of St. John's University along Utopia Parkway. The Grand Central Parkway divides the neighborhood. Like its neighbors Jamaica Hills and Holliswood, Jamaica Estates is hilly, part of the terminal moraine formed by a retreating glacier. South of Hillside the geography is flat. The terminal station of the F subway line is at the edge of Jamaica Estates on Hillside Avenue at 179th Street. The QM6, QM7 and QM8 buses run express to Manhattan along Union Turnpike. The neighborhood is convenient to the Grand Central Parkway and Clearview Expressway. Donald J. Trump, real estate developer and TV personality who was inaugurated as president of the United States in January 2017, grew up in Jamaica Estates. His father, Fred Trump, was a real estate developer in New York, and Trump was raised in an affluent household. Trump's early childhood home on Wareham Place was a relatively modest Tudor Revival built in 1940. It sold for $2.14 million in March 2017. The Trumps moved a few blocks away to a much grander house Fred Trump built in 1948 on Midland Parkway, also in Jamaica Estates. This brick mansion, in the Georgian Revival style, sits well back from the street on a large lot with landscaped grounds. In the comedy movie "Coming to America," the McDowell family led by Cleo McDowell the hamburger king, lives in Jamaica Estates at the fictitious address of 2432 Derby Avenue. The family's Tudor-style home is a setting that appears several times in the movie.